First post! | Fork off, heart disease! For my first foray into the blogosphere, I thought I would start with the most important meal of the day: breakfast. In a bid to cut down on processed sugar, I decided to give the boot to store-bought granola (which turns out to be quite high in fat and sugar) and make my own. As I discovered, there are a billion and one recipes for granola on the internet. However, I stumbled upon Mark Bittman´s version. Like many of Mark´s recipes, this one was also adaptable to suit our needs. You might be wondering two things: 1) is it worth making your own granola and 2) does it take a lot of time. I can readily answer: yes and no. So give it a go! 2 cups mixed nuts and seeds: a combination of sunflower seeds, chopped walnuts, pecans, almonds, cashews, sesame seeds, etc. 1. Heat the oven to 120°C. In a bowl, combine the oats, nuts and seeds, the coconut if you’re using it, cinnamon and salt. In another bowl, combine the agave nectar and nut butter. Tip in the wet ingredients with the dry ingredients. Spread evenly on a rimmed baking sheet lined with parchment paper and bake for 60 minutes. The mixture should brown evenly; the browner it gets without burning, the crunchier the granola will be. 2. Remove the pan from the oven and add the raisins and the additional seeds. Cool on a rack. Once completely cool, transfer to a sealed container and store in the refrigerator; it will keep indefinitely. 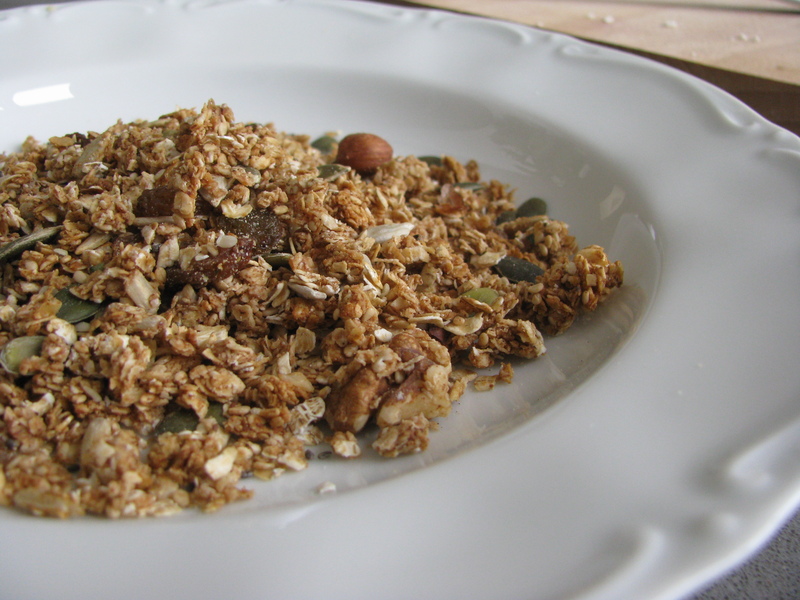 I make Jaime Oliver’s granola, very similar to this one. I use home dried fruit (you have to start doing this and avoid added sugar and chemicals). I use maple syrup and olive oil. It cooks at 350F for 20 minutes. Just a note: if you can get your hands on some unglazed stoneware, you only need to stir it once during cooking. Thanks Christine! I must correct my post cause I didn’t even need to stir the granola at such low temps.